112 • FOODSERVICE EQUIPMENT & SUPPLIES • SEPTEMBER 2017 chain profile in San Francisco and two in Chicago followed over the next several years. 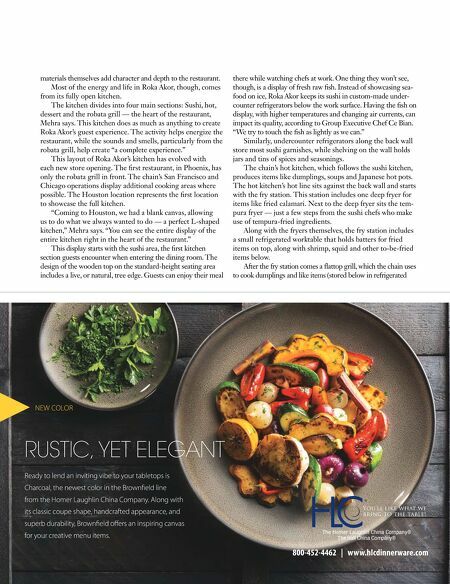 From that first store through today, the restau- rant's commitment to simplicity and quality continues to shine — in its food, its kitchen and in its design. 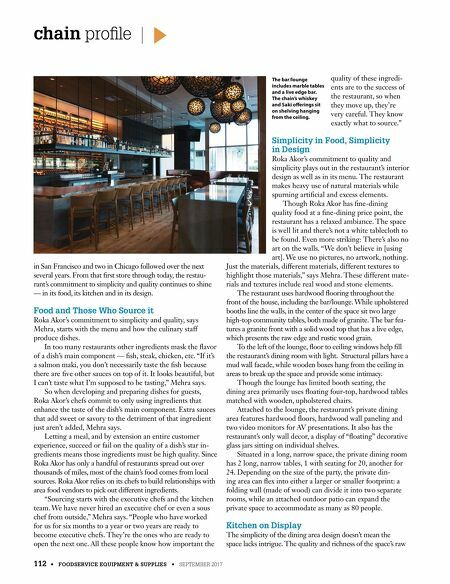 Food and Those Who Source it Roka Akor's commitment to simplicity and quality, says Mehra, starts with the menu and how the culinary staff produce dishes. In too many restaurants other ingredients mask the flavor of a dish's main component — fish, steak, chicken, etc. "If it's a salmon maki, you don't necessarily taste the fish because there are five other sauces on top of it. It looks beautiful, but I can't taste what I'm supposed to be tasting," Mehra says. So when developing and preparing dishes for guests, Roka Akor's chefs commit to only using ingredients that enhance the taste of the dish's main component. Extra sauces that add sweet or savory to the detriment of that ingredient just aren't added, Mehra says. Letting a meal, and by extension an entire customer experience, succeed or fail on the quality of a dish's star in- gredients means those ingredients must be high quality. Since Roka Akor has only a handful of restaurants spread out over thousands of miles, most of the chain's food comes from local sources. Roka Akor relies on its chefs to build relationships with area food vendors to pick out different ingredients. "Sourcing starts with the executive chefs and the kitchen team. We have never hired an executive chef or even a sous chef from outside," Mehra says. "People who have worked for us for six months to a year or two years are ready to become executive chefs. They're the ones who are ready to open the next one. All these people know how important the quality of these ingredi- ents are to the success of the restaurant, so when they move up, they're very careful. They know exactly what to source." Simplicity in Food, Simplicity in Design Roka Akor's commitment to quality and simplicity plays out in the restaurant's interior design as well as in its menu. The restaurant makes heavy use of natural materials while spurning artificial and excess elements. Though Roka Akor has fine-dining quality food at a fine-dining price point, the restaurant has a relaxed ambiance. The space is well lit and there's not a white tablecloth to be found. Even more striking: There's also no art on the walls. "We don't believe in [using art]. We use no pictures, no artwork, nothing. Just the materials, different materials, different textures to highlight those materials," says Mehra. These different mate- rials and textures include real wood and stone elements. The restaurant uses hardwood flooring throughout the front of the house, including the bar/lounge. While upholstered booths line the walls, in the center of the space sit two large high-top community tables, both made of granite. The bar fea- tures a granite front with a solid wood top that has a live edge, which presents the raw edge and rustic wood grain. To the left of the lounge, floor to ceiling windows help fill the restaurant's dining room with light. Structural pillars have a mud wall facade, while wooden boxes hang from the ceiling in areas to break up the space and provide some intimacy. Though the lounge has limited booth seating, the dining area primarily uses floating four-top, hardwood tables matched with wooden, upholstered chairs. Attached to the lounge, the restaurant's private dining area features hardwood floors, hardwood wall paneling and two video monitors for AV presentations. It also has the restaurant's only wall decor, a display of "floating" decorative glass jars sitting on individual shelves. Situated in a long, narrow space, the private dining room has 2 long, narrow tables, 1 with seating for 20, another for 24. Depending on the size of the party, the private din- ing area can flex into either a larger or smaller footprint: a folding wall (made of wood) can divide it into two separate rooms, while an attached outdoor patio can expand the private space to accommodate as many as 80 people. Kitchen on Display The simplicity of the dining area design doesn't mean the space lacks intrigue. The quality and richness of the space's raw The bar/lounge includes marble tables and a live edge bar. The chain's whiskey and Saki offerings sit on shelving hanging from the ceiling.